With a whimper and an arena full of stunned locals, the University of North Carolina men’s basketball team saw their season end Sunday. They were beaten badly by a Texas A&M squad that was more physical and, on that night, much better shooters. What it all means for Roy Williams, the underclassmen on the roster, scores of Heels fans and alumni around the country, and students and denizens of Chapel Hill is frankly no longer my problem (unless, of course, my editors insist that it is). Over the past few months, I upheld a weekly promise to cover the goings-on of Tar Heel basketball as they played out over the season. Thus, no more basketball, no more basketball column. A watch that included hours upon hours of game-watching, statistical research, and actual writing, now finished. My weeknights will be a bit freer, and weekends won’t have me watching every minute of every TiVo’d game so I could write about whatever had happened on the court. I figure between not watching, reading, and writing about games, I’m looking at an extra ten hours a week minimum, with which I can do whatever I want. So here are a few things I plan to do now that I don’t have to watch the Tar Heels in some fashion almost every single night. Take an evangelical pizza tour through the South to prove to the Yankees I left back in Jersey that, yes, there is good pizza in the South. Finish reading all the long-form pieces of journalism that have been sitting opened in tabs on Google Chrome for months. Teach my wife to drive stick. Take down my Christmas lights. Alternatively, convince myself that no one can even see those Christmas lights unless they’re right up close to the house so why bother taking them down? Learn what the hell lacrosse is all about so I know what to shout from the sidelines during my nephew’s games. Remind readers who insist on my being a Tar Heel homer that I am in fact a die-hard Villanova fan and alum. Spend more time in Raleigh. Read at least three books a day to my newborn son. Get really into something like hiking or kayaking, spend at least a thousand dollars on gear, then totally abandon it in a matter of months. 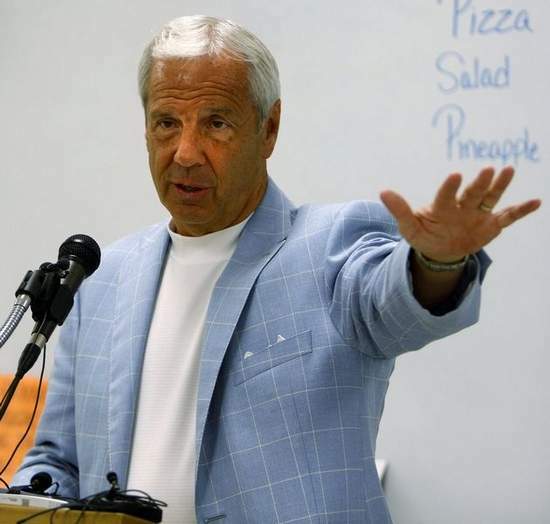 Find Roy Williams around town, ask about his tan. Seek out interesting sports stories. Read the six-hundred-page Mark Twain bio I bought in high school. Stop starting stories with musings on the weather. Work on my jump shot. Take the backroads to Charlotte. Construct one of those spiderwebs they always have in the police procedurals, with the bad guy (Trump) in the middle and all of his cronies and known associates spreading out across the bulletin board. Bone up on Carolina’s football recruits. Illegally stream the Peloton videos to my phone that is duct-taped to my bike’s handlebars. Plot out a European road trip that I know my wife and I won’t be able to take until our son is at least ten. Plot out a book tour even though zero publishers have shown interest in my memoir. Polish my pitch to publishers about how they ABSOLUTELY SHOULD CARE ABOUT YET ANOTHER SELF-IMPORTANT MEMOIR ABOUT A DEAD MOTHER FROM A COMPLETELY UNKNOWN WRITER. Continue to remind my friends that “It’s not a memoir, because that sounds pretentious. It’s an account of life and the relationships that we spend a lifetime building that are suddenly and furiously destroyed by death,” or something infinitely more pretentious than just saying memoir. Find Larry Fedora around town, ask about his ab regimen.